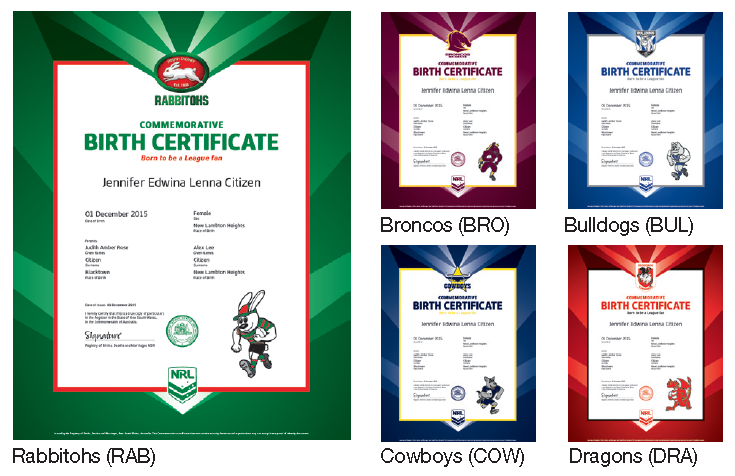 Mums and dads of NSW-born babies are going kind of nuts over these commemorative birth certificates that celebrate favourite rugby league teams. The special certificates are available to anyone born in NSW (not just babies!) and for the quite reasonable fee of $81, you can snap one up in the appropriate team colours for every league team. Each certificate is very boldly emblazoned with the team logo and categorically proves where its holder’s sporty allegiances lie. While these special editions might not be readily accepted as a fully compliant form of ID, they come with a standard birth certificate, in case you need to apply for a passport or the like some day. The Registry of Births, Deaths and Marriages hopes that League fans will snap theirs up and put them on display in their homes. They say a spike in demand is usually seen after grand finals are played, and while they’re popular with new parents they stress that they’re for fans of any age. If you’ve got an expectant sports fan in your circle, this could be the perfect way for them to celebrate their newborn! Alternatively, they suggest giving them “the Application form and $81.” Tick! Good call. Way better idea. Those keen to grab their very important team birth certificate can pop over to The Registry of Births, Deaths and Marriages. They’ll take you through the application process and answer all your burning questions. Top image: Jeremy Latimore with Everly, Luke Lewis with Hazel and Sam Tagatese with Faith being presented with their commemorative certificates by Mark Speakman. Picture by John Veage. Image via The Registry of Births, Deaths and Marriages.